Zionsville, Indiana is a town of approximately 26,296 people. Located in Boone County, it is the county seat and is about 20 minutes north of Indianapolis. The town was founded in 1852, although the earliest settlers came to the area in the 1820s. The town was incorporated in 1866. It grew as the railroad bringing merchants as well as new residents. This historic city promotes tourism, focusing on the brick-paved downtown, with the village atmosphere and small shops and restaurants. This lovely area features many parks with a variety of amenities. Zionsville Trail Park is popular with walkers, bicyclists, and runners. Starkey Nature Park is a 72-acre restructured nature conservancy, offering wooded trails as well as picnic spots. Lincoln Park, a small park in the downtown area once hosted Abraham Lincoln in 1861 when he stopped on his way to his inauguration. There are also recreational areas, like Mulberry Fields, which has athletic fields, a sledding hill, a skate park and a splash park. East of the city you will find two lighted tennis courts. They are adjacent to Lions Park, which also has seven baseball and softball fields on the 18-acre facility. Golfers will also be happy to find the Zionsville Golf Club, which is a nine-hole course. For a cultural change of pace, the SullivanMunce Cultural Center features an art center, a genealogy library, and a collecting history museum. Theater lovers will enjoy the Zionsville Performing Arts Center which has comedy, ballet and symphony performances. The real estate options in this historic town will give you a taste of the small town, as well as thriving modern architecture. Established neighborhoods with lovely yards offer older and updated ranch and split-level homes as well as traditional cottage homes. There are also newer homes, some with architectural styles to fit into the small town feel of the area. Those who prefer townhomes, you’ll find those as well. The area has plenty of shops and restaurants, the schools have a good rating, and the area is safe. Many consider it a great place to raise a family. 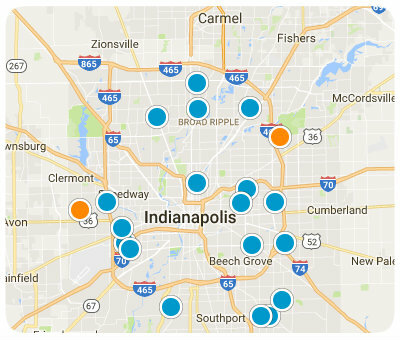 With the many positive aspects of the area combined with the proximity to the amenities of a big city, then this becomes a must-consider destination for home buyers searching in the Indianapolis area. If you would like more information on homes for sale in Zionsville, Indiana, please contact us today and allow us to assist you.